Readers may be familiar with the famous incursions of Islam into Europe: the swift move onto the Iberian Peninsula and then into France (where Muslim forces were finally turned back at the Battle of Tours in 732); and much, much later, the last Ottoman attempt to take Vienna in 1683. Perhaps less known is the Arab/Muslim presence in Sicily in the 900s, the subsequent Emirate of Sicily (part of the Fatamid caliphate, the capital of which was Cairo), and then the Christian reconquest of Sicily by the Normans between 1060 and 1090. That reconquest led to the anomalous presence of a Muslim enclave on the southern Italian mainland in the town of Lucera. When the Normans retook Sicily, there followed a period of relative tolerance. Muslims paid an extra “freedom of religion” tax, just as Christians had paid it when Islam had ruled the island, but that was the extent of religious “oppression” under the Normans. The tolerance extended for a while even into the period of the Hohenstaufen dynasty that followed the Normans. But by that time, the Christian west was up to the third or fourth Crusade, and religious intolerance was gaining momentum that still has not slowed perceptibly. Frederick II of Hohenstaufen (1194-1250), the young king of Sicily, was not yet the mighty Holy Roman Emperor, diplomatic Crusader, kidnapper of monks, invader of Rome and all-around ferocious enemy of the Papacy [see The Papal States]. The young Frederick couldn’t resist Christian calls to crack down on the “infidels” of Islam on his home island of Sicily. The Muslim population of Lucera included about eight or nine thousand soldiers, who served their Christian king, Frederick, faithfully. Frederick used them in a number of battles, including his siege of Rome in 1239. The rest of the Muslims in Lucera built a good reputation in farming, medicine, crafts and animal husbandry (including the breeding of such exotic animals as leopards and bears). Muslim efforts helped Lucera become the site of one of the seven great commercial fairs sanctioned by Frederick in his kingdom every year. When Frederick died in 1250, the Lucera colony of Muslims supported his natural Hohenstaufen successor, Manfred. A continued Hohenstaufen reign was not to be, however, and the entire Kingdom of Sicily (which meant all of southern Italy) was swept up in the struggles between the Guelphs and the Ghibellines—that is, respectively, the power of the Papacy and that of the Holy Roman Empire. For 15 years, armies of the Hohenstaufen successors fought Angevin French armies for control of the south. The entire weight of the Papacy was against the Hohenstaufens and behind Angevin claims to the crown of Sicily. 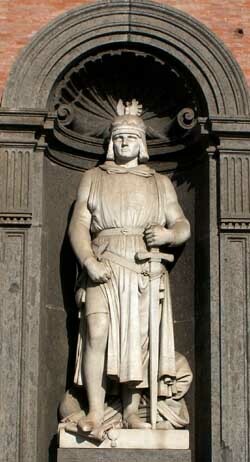 The Hohenstaufens were defeated and the Kingdom was taken over by the Angevin dynasty, ruled first by Charles I (king from 1266-85) and then Charles II (1285-1309). The Muslims in Lucera had actively supported Manfred; Lucera, itself, had even served as Manfred's base of operations and had to be militarily taken by the Angevin armies in 1268. In spite of all that, the Muslim community accepted the new rulers, and the population was not immediately affected by the change of dynasty. That is to say, there were 14 (!) popes between the death of Frederick and the year 1300, and three Crusades were waged in the Holy Land in that period; yet, there does not seem to have been any Papacy-sponsored push to encourage the Angevins to expunge the Muslims in Lucera. They were great producers of revenue for the Angevin kingdom (with its capital now at Naples) and represented no real physical threat. The colony continued to thrive and Muslim soldiers in the community even saw service in the Angevin armies. It may also be that other historical considerations played a role in delaying Angevin moves against Lucera; that is, Charles II was very busy elsewhere trying to maintain the integrity of his new kingdom in the wake of what is called the Sicilian Vespers, an anti-French revolt in Sicily in 1282, the end result of which was the loss of the entire island to the Aragonese. That hostile situation abated in the 1290s when the Angevin rulers of the mainland and the new Aragonese rulers of Sicily were linked by royal intermarriage. The end came in 1300 during the papacy of Boniface VIII, perhaps the greatest representative in Roman Catholic history of papal supremacy over the temporal affairs of men. The year 1300 was the year of the great Jubilee, the high-water mark of papal power. There is no unanimity among sources as to why the forces of Charles II finally descended on Lucera on August 24, 1300. If one looks for a religious reason, maybe it was, indeed, the zeal driven by the idea that the Catholic pope should rule the earth and that a Muslim community simply could not be allowed to survive in a Christian kingdom. Fear of rebellion? It does not seem likely that the Muslims in Lucera were about to revolt; they had built a thriving community over two generations and were even treated relatively fairly by the Angevins. (As late as 1295, Charles II sent an emissary to Lucera to look into Muslim charges that their taxes were too high.) Greed? That is possible, but it would have been a short-sighted killing of the goose that laid the golden eggs to simply go in and take everything the Muslims had. That is what happened, however, for whatever reason. 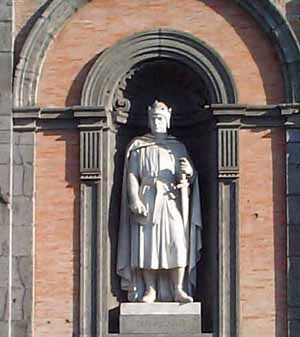 Muslim Lucera was sacked by Charles II in 1300. The entire wealth, property and livestock were taken. The mosques were destroyed and those that had worshipped in them were exiled (some fled across the Adriatic) or were sold into slavery. The social and political leaders of the community were imprisoned in Naples. Some of the community were attacked and murdered as they fled Lucera. The cathedral of Lucera was built on the ruins of a destroyed mosque. The Civic Museum in modern Lucera retains some shards of evidence, such as pottery with Arabic inscriptions, that recall this brief period of Muslim presence. —Ahmad, Aziz. “The Shrinking Frontiers of Islam” in International Journal of Middle East Studies, Vol. 7, No. 2 (Apr., 1976), pp. 145-159. Cambridge University Press (UK). http://www.meridiano16.com/Appunti_e_libri_gratis.php Retrieved April 30, 2009. —Edido, Pietro. La colonia saracena di Lucera e la sua distruzione. Naples, L. Pierro and Son, 1912. —Goodwin, Stefan. Malta, Mediterranean bridge. Greenwood Publishing Group, 2002. —Johns, Jeremy. Arab Administration in Norman Sicily: The Royal Diwan. Cambridge University Press, Cambridge (UK), 2002. —Metcalfe, Alex. Muslims and Christians in Norman Sicily: Arabic Speakers and the End of Islam. Routledge, 2003. — Runciman, Steven. The Sicilian Vespers: a history of the Mediterranean world in the later thirteenth century. Cambridge University Press, 1958. —Taylor, Julie. Muslims in Medieval Italy: The Colony at Lucera. Lexington Books, 2005 and review of same by William Granara in The Journal of Religion, Chicago Journals, University of Chicago Press, Oct 2005. —Sedgwick, Henry Dwight. Italy in the Thirteenth Century. Houghton Mifflin Company. Boston and New York. 1912.